This post is part of an on-going series, The Odyssey of Captain America, which follows Steve Rogers’ life and times as the Living Legend. This segment continues to look at modern-era, retro-continuity stories that relate Cap’s earliest WW II experiences. Roy Thomas’s Golden Age “Dream Team” remained a tempting topic to revisit over the years, particularly since, in one form or another, all of the team members continue to figure largely in the MU mythos up to the present. The Invaders are in Germany, Feb 1942, on the trail of the Red Skull, Baron Strucker, and a mysterious occult group called “The Thule Society,” who have been sacrificing Atlanteans in a ritualistic quest for a powerful cosmic weapon. The heroes arrive too late to stop the atrocities, but they follow the trail to Antarctica where a mystical hammer has fallen to Earth. Warned of the Invaders’ arrival, the Red Skull abandons his quest. The mysterious hammer and its Thule protectors are cloaked by ancient spells. Unaware of its presence, the Invaders depart. “At least we stopped his master plan,” Cap offers. Namor is not satisfied to have things end with so many unanswered questions. 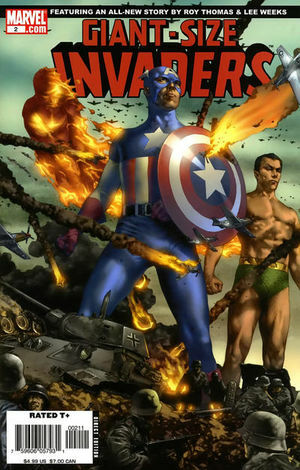 Sometime in early 1942 the Invaders stop a Nazi/U-Man/Atlantean invasion on the U. S. Atlantic coast. Three weeks later, now “somewhere in Poland,” the Invaders (less Bucky) have been captured by Arnim Zola, who is trying to transfer their combined powers to an enhanced “Ubermensch.” As he contemplates a rescue effort, Bucky recalls how inadequate he felt among his super-powered teammates during that state-side mission; his youthful bravado had allowed U-Man to get away. This time, he proves his worth, earning a hard-won but back-handed compliment from Namor after helping his teammates escape from captivity. 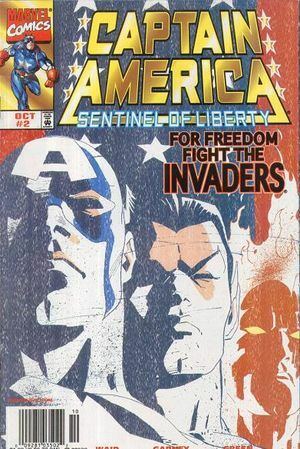 The Invaders title itself was also revived several times. Giant-Size Invaders #2 (2006) gave us “A Drive in the Country,” when Cap, Torch, Sub, and Miss America protect FDR & Churchill (yet again!) at FDR’s Hyde Park Estate in New York on June 19, 1942. Just a few days later, a second Invaders series (4 issues, 1993) opens with a June 22, 1942 radio broadcast. This team brings the Golden Age Blazing Skull, Silver Scorpion, and Vision to the “modern” MU (and the team); it features Liberty Legion members as well. Their foe is a team of powered Americans (“Battle-Axis”) who are Nazi sympathizers. While most Invaders stories (including the two previously mentioned) are set in 1942, others show the team in action together until the end of the war. Early nemesis Baron Blood reappears in Constanta, Romania. Cap is bitten and briefly becomes a vampire but reverses the curse when he drinks Bloods’ own blood during a fight bite (CA #616 70th Anniversary Special, 2011). In CASL #2-4 (1998), Nazis have infiltrated Atlantis. 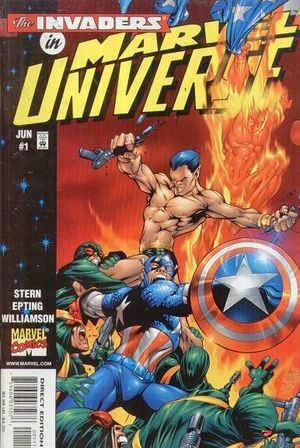 This tale focuses on Namor’s complicated family relations, the Human Torch’s existential dilemma, and Cap’s steadfast resolve under pressure (which finally saves the day). 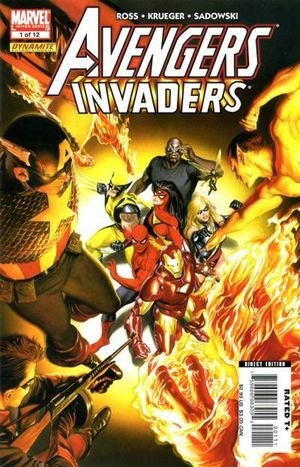 On Oct. 5, 1943, the Invaders come across time-displaced members of the Thunderbolts in Austria (Thunderbolts #164, 2011). 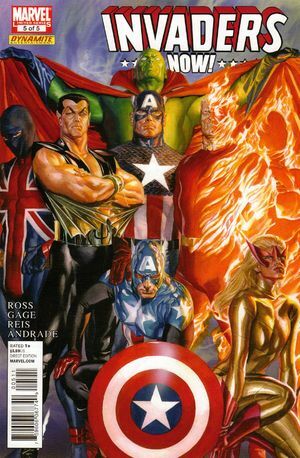 The twelve-issue Avengers/Invaders series (2008-09) opens December 1943 with the Invaders in Italy, storming Monte Cassino in the so-called Ordnung Zeitgeist (Time Ghost) mission, which brings them to present to meet their future selves. The Invaders fight the Red Skull and German soldiers at the Battle of Anzio in Italy on January 22, 1944. (New Avengers #29, 2012, fb). June 1944 the Invaders are on the coast of Crete facing off against Master Man, Warrior Woman, U-Man, Lady Lotus, Agent Axis, Scarlet Scarab, Teutonic Knight; Namor arrives with “behemoths from the deep,” creating a massive wave that crushes the enemies (flashback in All-New Invaders #4, June 2014). Sometime in June/July 1944, the Invaders fought with the “Red Tails” Fighter Group of Tuskegee Airman pilots, most like during the advance through Italy (Namor recalls this in Adam, Legend of the Blue Marvel 4, 2009). An intriguing Invaders story set “late in the War” features Nazi Baron Strucker in the formative years of Hydra. Using funds from Red Skull (who makes brief appearance), he plans to lead this splinter group after the war. The “Dragon Ship” in this story originally appeared in Captain America Comics #5 (1941), where it was described as “the greatest weapon of the Imperial Japanese Army.” It is now in the hands of Hydra and Strucker, who has traveled to the future using Dr. Doom’s Time Machine and learned of the impending fall of the Third Reich. While the Invaders thwart Strucker’s immediate plans, Hydra, of course, endures long into the future. Rightly so, as it turns out. Namor would later learn that the skin off the backs of his tortured subjects would embellish the cover of “The Book of the Skull,” which would lead the Red Skull’s daughter back to this place more than 70 years later (Fear Itself Prologue: The Book of the Skull, May 2011). 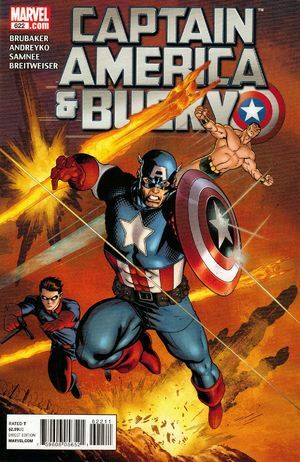 CA & Bucky #622 (Nov. 2011). 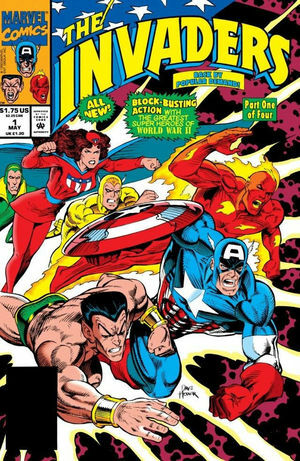 A note on the “Battle-Axis” page of the Marvel Database reads, “All of the Battle-Axis characters had originally appeared as heroes in the Golden Age comics of the ’40s. Roy [Thomas] gathered together some of the most forgotten heroes and turned them into Nazis, making for a great story.” http://marvel.wikia.com/wiki/Battle-Axis_(Earth-616). In addition to these revivals, there would be New Invaders (9 issues, 2004-5), Avengers/Invaders (12 issues, 2008-9), Invaders Now! 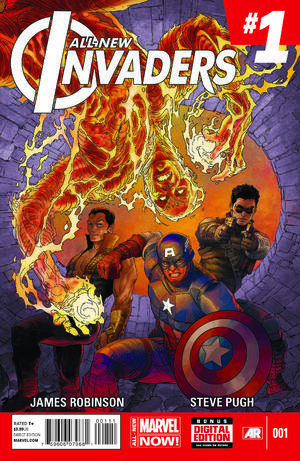 (5 issues, 2010-11) and All-New Invaders (15 issues, 2014-15). Zola’s first published appearance (in his familiar robotic form) was in CA #208 (1977). This Invaders Now! story is his first chronological appearance. In issue #2 he transfers his consciousness into a robotic body to avoid exposure to the deadly infection. Invaders Now! (5 issues, 2010-11), Christos Gage and Alex Ross. After this establishing flashback, the storyline picks up with a modern-day re-appearance of the deadly infection. Arkus, the Golden Age Vision, must rally the existing Invaders to counter the threat. Another nice tidbit in issue #2 comes in a remark by modern-day Union Jack, inferring that the Invaders’ war exploits were featured in MU’s version of Ken Burns’ WWII documentary. Wolfgang von Strucker first appeared in publication history as a Nazi officer in Sgt. Fury and His Howling Commandos #5 (Jan. 1964, two month’s before Cap’s Silver Age reintroduction). He reappeared as the leader of Hydra in Fury’s SHIELD stories, beginning in Strange Tales #155 (May 1967). Marvel Universe #1-3 (June-Aug 1978). The series includes brief summaries of Cap, Torch, Submariner origins (via reflections by Betty Dean, Phineas Horton, Gen. Phillips). Doom appears as the bandaged man, normal in “present.” The “bandaged” Doom seems to be a cross-over with an Invaders storyline from issues #32-33 (1978). Up Next: More modern stories that “look back” at Cap in WWII! Teaching and writing have been my life's work for over two decades as a journalist and educator. My degrees in History were earned at Illinois State University, and I've done additional graduate work at Lincoln Christian Seminary and Urbana Theological Seminary. Over the years I’ve led conference workshops and authored articles and book chapters on topics ranging from religious education and international student ministry to state and local history.